Punica granatum. Pomegranates have enriched human history since people painted themselves red with the juice at the dawn of civilization. The photo at left shows ripening pomegranates at the Temple of Aphrodite in Cyprus. According to Greek myth the first pomegranate tree was born in the blood of Side, Orion's wife who jumped off a cliff when she was tricked into thinking she had killed her children. The fruit has symbolized death and rebirth ever since. The genus name Punica is the old name for the ancient city of Carthage. Today's world has more prosaic concerns, such as the health benefits of the juice and seeds. Pomegranate juice has more than twice the amount of antioxidants found in grape juice, green tea or red wine and reduces hardening of the arteries. The alkaloids of the pomegranate have the unique ability to paralyze tapeworms and that's enough about that topic. The bark in particular is biologically active and is antibacterial as well as antiviral. Pomegranates are arching deciduous shrubs, about 15' tall and equally wide in suitable climates. You can prune them into a tree if desired. They need hot summers for good fruit development and moderate winters for survival (to 15 degrees F). Winter chill requirements are low, less than 200 hours below 40 degrees F. A south or west wall helps the fruit ripen. 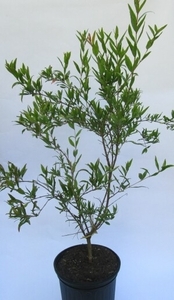 Full sun, low water requirements, although regular and deep watering helps fruit development and reduces the number of thorns. Can take alkaline soil. Pomegranates are also resistant to honey fungus, good news for Northern California gardeners fighting this soil-borne disease. Do not disturb roots when planting, just place in soil and tamp down. Self-fertile, summer flowering on tips of current season's growth. Fruit ripens in fall. Plant sizes vary--read individual descriptions. Expect flowering and fruit within two years. Truly an eye-popping ornamental. Shipping charges are 35% for CA, 40% for OR, WA, AZ and NV, and 45% to rest of U.S. For orders of 2 or more plants, we can sometimes bundle them together and then reduce ship charges-please send an email describing your proposed order with zip code and we can give you exact ship costs. Sorry, no shipping to AK, HI. Orders received by Fridays at 5 pm will ship the following Monday and arrive at the latest the following Saturday. Punica granatum.The name tells all for this pomegranate variety--tangy flavors are overlaid with a soft finish in the tantalizing juice of 'Sharp Velvet.' Fruit is a dark burgundy inside and out. Tree grows more upright than other varieties and is also more productive. Best in hot summer areas. Plants have been pruned back to 2' are well developed in 4" x 9" pots, as of January 2018. OUT OF STOCK. Punica granatum. 'Eversweet' combines nearly seedless pale pink arils with a clear, very sweet juice that will not stain your marble counters. Pink globes ripen early to midseason. Adaptable variety suitable for coastal and inland areas. Spring flower display is terrific, with large tangerine flowers worthy of any mixed border. 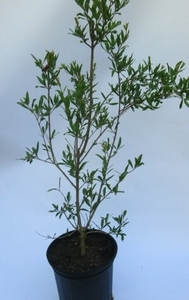 Grown in 4" x 9" pots, plants are well-established, about 3' tall as of April 2019. Punica granatum. For those with a sweet tooth, the White pomegranate delivers. This variety has the highest sugar content of any pomegranate and it has a good supply of juice as well. Rind is more pink than white, but the interior flesh is white with pinkish seeds. Ripens early. About 2' tall as of January 2018. OUT OF STOCK. Punica granatum. 'Sweet' pomegranates make smaller trees than other varieties, so this one does well in pots. Copper-red blossoms in late spring are followed by pink globes that have the sweetest juice of all. Will grow well in cool-summer locations. 3' tall plants in 4" x 9" grow pots.